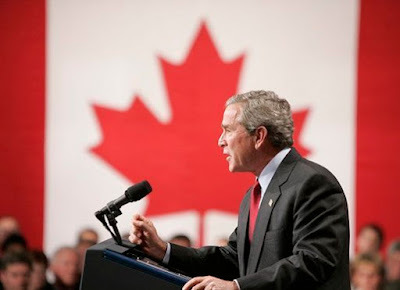 In late 2004, the President of the United States of America came to Halifax. I had almost forgotten about the visit until I came across this short account in my archives. This was written for the progressive Catholic newspaper called Catholic New Times. I was clearly struck by how easily public opinion swung toward George W. Bush just by virtue of a quick visit and a couple of jokes. It explains a lot. Before he even got here, our premier, John Hamm told us to be polite and give him a warm Nova Scotian welcome – do it the “Nova Scotian way,” he said. Our mayor and the chief of police said that we were allowed to demonstrate but we must be peaceful and show respect for a duly-elected leader of a democratic country. By the time he left, I felt that I had been patted on the head with condescension so many times that I had to go get my hair done. As usual, that made me feel better which was a good thing because by the time he left, I was feeling deflated and somewhat discouraged. He travelled from the airport in his husky bullet-proof limo, accompanied by a couple of kilometres of entourage. They all scooted through an emptied-out downtown Halifax, and scuttled up to the back door of Pier 21 – avoiding the 4000 (well-behaved) protesters. The people awaiting George within Pier 21 had been there for over three hours (no food, no coffee), having been admitted after a strict security clearance. In retrospect, it may not be so surprising that, the instant he appeared, he was given a standing ovation. Then he made the speech – the one that got lots of laughs and applause with hockey and Jean Poutine jokes – and went on to scold Canadians for not going to his war and for disapproving of his missile defence plan. He finished and he got another standing ovation. Then he left. The following day, the editorialists mostly focused on how well-behaved the protesters were and how polite everyone had been. There was much about how important it is to have good relations with the U.S., no matter what – trade, you know. There was almost nothing about Bush’s hateful ideology, his murderous war, his harmful tax cuts. There was just a superficial observation about how good his researchers must be (well, he quoted Mackenzie King!) and how charming he is and a Great Communicator too. I shake my head – but then, I never “got” Ronald Reagan either; he always seemed to me to be just some duffus who was orchestrated by someone else – oh, that sounds familiar. The worst thing about Bush’s visit – and for this, I blame the premier, the mayor, the chief of police and the media (which mostly paid little attention to the protests – they were peaceful, remember) – is that the Bush-supporters have now come out of their caves in brave numbers. They have come out not only to uphold Bush’s policies but to insult, in the clearest possible terms, the 4000 Nova Scotians who went downtown to protest the visit. I wait patiently now for the premier, the mayor, the chief of police and the media to pat the Bush-supporters on the head and suggest that they be polite, that they express themselves in the “Nova Scotian way.” Then I will sit back and wait to see how the brutal, intolerable philosophy of the Bush administration can be defended with any kind of rational argument.